Dukkah, which is pronounced doo-kah, is an Egyptian condiment / spice mixture with a distinctly nutty taste. It actually derives its name from the Arabic term for pounding which makes sense since the blend of spices is traditionally pounded together in a mortar and pestle. It's definitely not a typical spice blend but, rather, a wonderfully fragrant combination of roasted nuts and seeds. While dukkah is commonly found in the markets of the Middle East, especially Egypt, in the United States you should be able to find it ready made in most ethnic markets, possibly some gourmet stores and larger farmer's markets that feature spice vendors. But it's also easy enough to make at home and you'll get the benefit of the freshly roasted flavor. There are also a lot of possible variations so it's fun to experiment and find your perfect custom blend. The house dukkah, if you will. Speaking of different blends, there are loads of different recipes for dukkah but some common ingredients. All the mixtures will probably include nuts, sesame seeds, coriander and cumin. 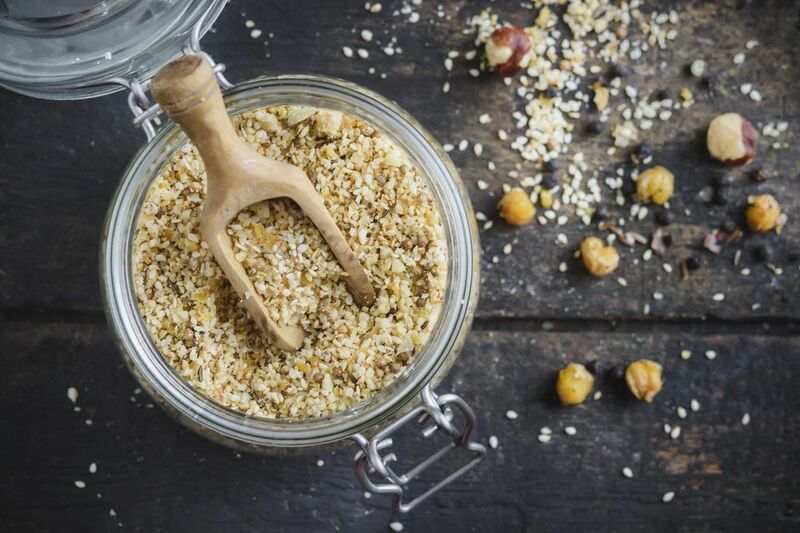 Hazelnuts are the most common nuts used but, again, other ingredients such as pine nuts, pumpkin seeds or sunflower seeds, might be used with or instead of the hazelnuts. From there, individual cooks can add their own touches like mint, dried thyme or peppers for a bit of heat. Although most dukkah blends will probably not contain roasted chickpeas, some of the more ancient recipes call for them. And since I love all things chickpea, I knew I had to make my "house dukkah" that way. The most common use for dukkah is as a crust for lamb, chicken or fish. It's also wonderful sprinkled on roasted vegetables such as carrots, feta cheese or as a dip for pita bread. Swirl it into some good olive oil or into your favorite tahini sauce or hummus. On a baking sheet lined with parchment paper, spread the sesame seeds out in a single layer. Roast in the oven for about 2 to 3 minutes. Remove from the oven and set aside to cool. Place the chickpeas and hazelnuts on the same baking sheet and roast in the oven for about 5 minutes. Remove and combine with the toasted sesame seeds. Combine the sesame seeds, chickpeas, hazelnuts, coriander seeds, cumin seeds, salt, and black peppercorns in a food processor and grind for 2 to 4 minutes. You can also mash all the ingredients with a mortar and pestle until ground up. Use in your favorite Middle Eastern recipes and enjoy!